Ah gophers. They make holes in your garden, eats your plants, and what’s the best way to deal with them? A rolling bomb you roll towards the little rodents. Oh heck yeah. Gopher Go Boom is a marble labyrinth game where you roll a bomb through a field of mazes, obstacles of instant death, and many different walls in order to destroy the rodent that is eating your carrots. Eating YOUR carrots!! Brought to us by 3D Dog Studios on the iPhone, iPod touch, iPad for $0.99. Let’s check out the list of what this game brings to the competition of all other app games. You got yourself 3D gophers that get exploded with bombs. Check. 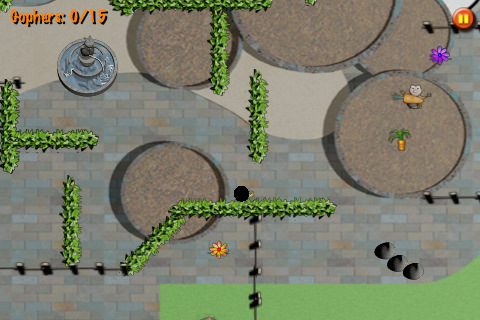 You have multiple levels where the main obstacles are flowers and flower pots. Check. You got yourself sound. Che—wait what? So yeah, in the App description, one of the main features is ‘sound’. That –sounds- like they are stretching out the description to make a relatively simple game seem larger than it is… and it’s true. BUT, that is not a bad thing. Gopher Go Boom is a simple game with a fun idea for us demented players with a vendetta against gophers. You tilt your phone to move a bomb around. You maneuver the bomb past extremely small items that can instantly destroy your bomb, sending you back to the starting point. You have a limited time to destroy the gophers so it’s all about trial and error. I found that the graphics were alright. I cursed like a sailor every time a brown flower pot was sitting on a brown background and I ran right into it. I cussed like crazy when I had to restart a level over and over because the flowers all basically kill your bomb instantly… sometimes. I believe the way they work are: the bright blue flowers explode but go away permanently, the darker purple ones respawn after bouncing you, the orange ones destroy you instantly but respawn and the flower pots disappear permanently after killing you. That’s the main issue I had. Most of the levels, the death traps are placed so you are almost guaranteed to hit them. Most death traps go away after one hit so you don’t have to worry about them anymore, but man, it’s so incredibly frustrating to navigate without any sensitivity controls. Inflexible controls and no detailed explanations of what the death traps actually do is balanced by it’s simple yet functional gameplay, multitudes of different levels (some more fun than others), and a fun premise balance Gopher Go Boom into a range of slightly above average. This is an interesting game app for kids, though I’d worry about the frustration factor. Consider this a 3.2 or 3.3 out of 5 if you like marble labyrinth games. 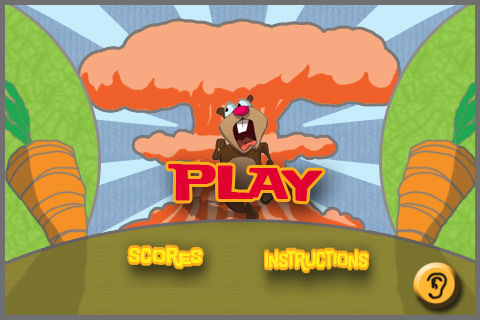 AppSafari review of Gopher Go Boom was written by Joseph Ho on October 27th, 2010 and categorized under App Store, Games, Physics Based, Puzzler. Page viewed 3305 times, 2 so far today. Need help on using these apps? Please read the Help Page.